This is our last day of biking through southern Denmark, this beautiful land full of thatched-roofed farmhouses and secluded beaches. We'll head south from Haderslev, on Jutland's east coast, and cross the border to Flensburg, in Germany. We'll continue following Danish National Bike Route 5 southwards at first, but this section is no longer called the "Water Way" like yesterday, it stays inland. We'll ride through the countryside mainly, with only a few glimpses of water today. Later, we switch to National Route 3, continuing south as route 5 turns eastwards. We first head westwards out of town, along the Haderslev Dam, a dammed-up lake that empties into the fjord. Once the route leaves town, it turns southwards. We'll cross a couple of highways, then bike past Slivsø, a lake with a little beach. Later, we arrive at the first stop along the Baltic coast at Sønderballe Strand, a curving stretch of sand and boat docks. I jumped into the water here for a good cool-off. You now pedal uphill to get into the plateau above, going through fields and villages, like Kiplev and Hølbol. The last big Danish town of the ride comes up soon, Aabenraa, another harbor town on the end of its own fjord. It's worth it to walk around the old town, and -- at halfway along today's route -- time for a break. Nachos and a Blackbird beer hit the spot! I stopped into the church because I wanted to see an example of a typical Danish port tradition: sailing ship models hanging from the church ceiling. I've only ever seen that in Denmark. Leave town along the waterfront, passing the giant marina. Now the route zig-zags a bit on its southward journey, avoiding the main roads and taking you from one village to another. Finally, bike-route 3 hits Kollund Strand, on the Flensburg Fjord. Stop at one of the little beaches for a last swim and a great view over the water. That's Germany off on the other side. 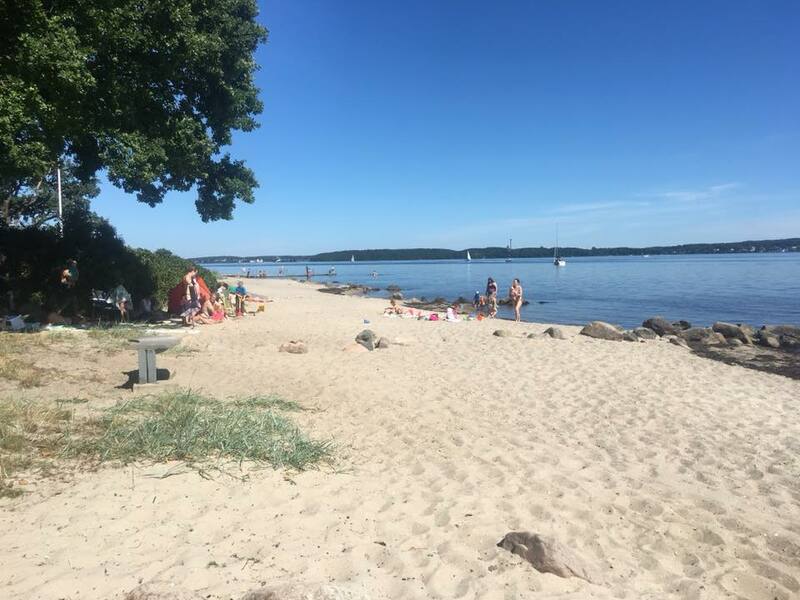 So now you follow the trail west across the border and past Flensburg's Wassersleben beach. Continue south past the shipyards and you'll find yourself at the town's cool waterfront, with its big collection of wooden ships and a wooden-boat restoration club. Hansen's brewhouse, right on the water, is a great place to celebrate the end of a great week with just as great food and beer. Enjoy!